Nevis (pronounced nee'-vis) is part of the St. Kitts & Nevis Federation, an independent nation within the British Commonwealth. The Federation received its independence from Britain in 1983, and British influence is still strong. Nevis was presumably named by Christopher Columbus, who sailed by and landed on St. Kitts in 1493. Nevis comes from the Spanish word for snow; the name was inspired by white clouds around Nevis Peak. Nevis is one of the Leeward Islands and lies about 200 miles south of Puerto Rico. (See a map of the Caribbean Sea here.) 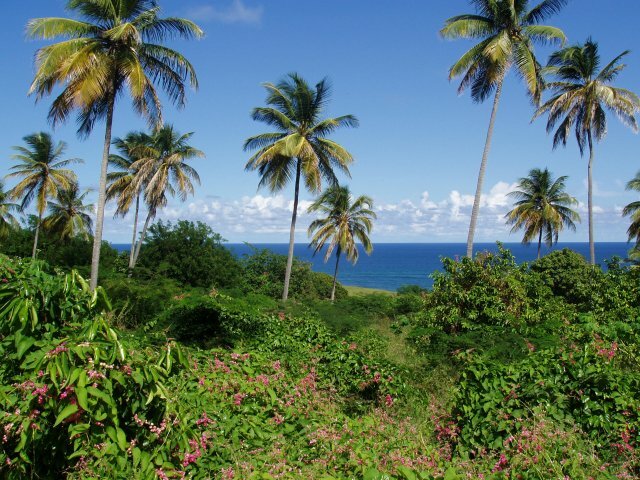 Nevis is slightly elongated, 7 miles long and 5 miles wide with an area of 36 sq. miles. (See a map of Nevis here.) A drive around the island on the main road takes about an hour. The beautiful Nevis Peak, an extinct volcano (elev. 3,232 ft.), dominates the landscape. Nevis is separated from St. Kitts by a narrow strait. Nevis is exceptionally green with some rainforest up in the hills. Like all Carribbean islands, Nevis has a long history of battles, pirates, and hurricanes. In the late 17th and early 18th centuries, sugar production on Nevis surpassed most other Caribbean islands, making it a valuable possession and gaining it the name of "The Queen of the Caribees." For an entertaining (if not 100% accurate) account of Nevis history, get a copy of Swords, Ships, and Sugar: A History of Nevis to 1900 by Vincent K. Hubbard. About 10,000 people live on Nevis, most of African descent. The official language is English. Nevis is relatively prosperous, with a literacy rate exceeding 97% and an average life expectancy of over 67 years. The capital of Nevis is Charlestown. Nevisians are church-going people with Methodist, Baptist, Roman Catholic, Jehovah’s Witnesses and other faiths represented. There is no synagogue but there used to be one in the 17th - 18th centuries; a Jewish cemetery with some 300-year-old graves is located near the center of Charlestown. There is no agriculture left on Nevis beyond small farming; sugar production stopped long ago. The main source of income is tourism. The luxury Four Seasons resort is the major employer. Nevis is quieter and more upscale than St. Kitts; there are no cruise ships, casinos, or high-rise hotels on Nevis. And Nevisians like it that way. The year-round temperature ranges from 25oC to 30oC (77oF - 86oF), usually with a cool breeze on the Calypso and Iris verandas. In October and early November Nevis may get some clouds and rain. The rest of the year, occasional tropical showers lasting only a couple of minutes bring spectacular rainbows over the sea. The official currency is the Eastern Caribbean Dollar (EC), which is tied to the US dollar at the rate of US$ 1 = EC$ 2.66. US dollars are accepted everywhere, though change may often be given in EC. Credit cards are accepted widely, including some grocery stores. There are a number of ATMs in town and at the airport. Direct dial to and from the US, area code 869. Cable or wireless Internet access is available at the villas. It is probably better to just take a cab from the airport on the day of your arrival. Nevis Car Rentals (869-469-9837; Fax: 869-469-9827), M&M Car Rentals (Marlon, 869-663-2013), Striker's Car Rentals (869-469-2654), TDC (869-469-5690), and other car rental companies will bring a car or a jeep to your villa or will pick you up. Driving is on the left side. A jeep may be more fun ($45-$55 US/day). Taxis are readily available but not cheap ($11 US for a five-minute ride from the airport to Calypso and Iris). "Dollar Buses" (actually minivans) go to Charlestown ($3 EC) and elsewhere around the island every half hour or so. Mountain bike rentals are available just below our villas on Oualie Beach (869-469-9682). Ferries to St. Kitts leave 3 times daily from Charlestown and take 40 minutes. Call 869-466-4636 for a recording of daily ferry schedules. See news and information at sknvibes.com, the lovely and detailed web site of the Nevis Tourism Authority, www.nevisisland.com, and the St. Kitts and Nevis official government web site, www.stkittsnevis.net.